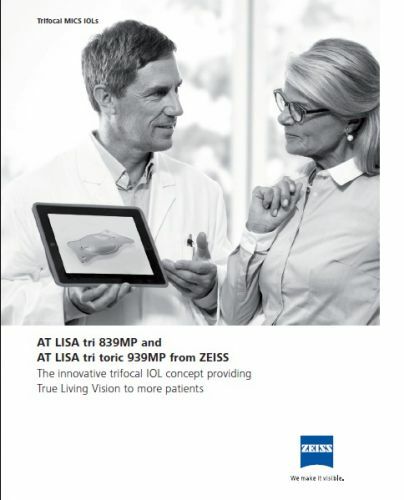 AT LISA® tri and AT LISA tri toric from ZEISS represent the next generation of ZEISS multifocal IOLs and are the first trifocal and trifocal toric preloaded true-MICS IOLs for True Living Vision. These two members of the ZEISS AT LISA tri family, based on the proven ZEISS AT LISA platform, provide excellent intermediate vision without compromising distance and near vision due to an optimized optic design with an additional dedicated focal point. 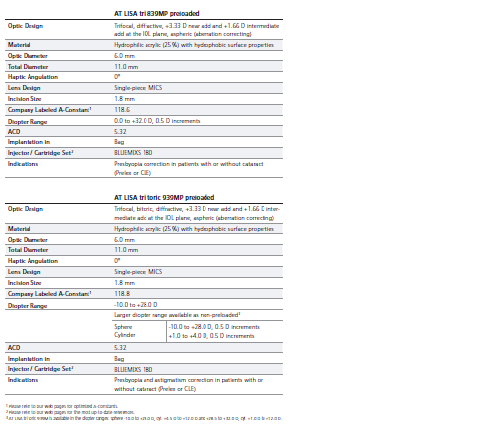 The near and intermediate additions of the ZEISS AT LISA tri 839MP and ZEISS AT LISA tri toric 939MP are +3.33 D and +1.66 D, offering a comfortable reading and intermediate distance of approximately 40 and 80 cm respectively. Clinical results show that the ZEISS AT LISA tri 839MP provides excellent intermediate visual acuity in addition to very good far and near vision. The monocular uncorrected and best distance corrected near and intermediate visual acuity were measured at 33 to 40 cm and 66 to 80 cm respectively. Study showed excellent results for uncorrected intermediate vision at 66 cm and 80 cm (logMAR 0.06 and 0.03, respectively) which confirm the broad distance range of functional intermediate vision with this lens. 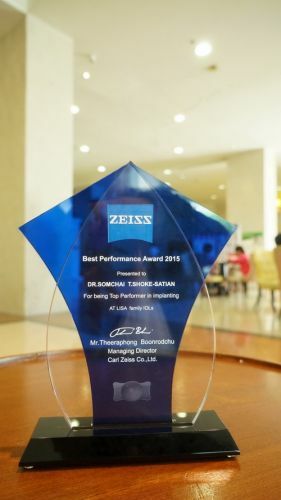 Clinical results show that the ZEISS AT LISA tri 839MP provides very good post-operative refractive results. achieved a SE ± 0.25 D.
The very good refractive outcomes are reflected in the results of the patient satisfaction evaluation in a study. After 6 months, 100 % of the patients were satisfied with their distance and intermediate vision and 93 % with their near vision. High satisfaction scores were found in all studies and 96 % of the patients of this study stated that they would choose a multifocal lens again. A high level of patient satisfaction was also reported in many studies. Thirty thousand patients were asked to rate their vision in certain situations. Most patients stated to be satisfied or very satisfied with their vision at all distances. Low levels of halos (15 %) and glare (10 %) were found after 6 months in a study in 34 patients. This might contribute to the high level of patient satisfaction in most studies. In our study, monocular photopic contrast sensitivity of 60 eyes was measured without best distance correction after six months using the CSV-1000 test. The clinical results demonstrate that photopic contrast sensitivity is maintained within the normal range. This is achieved due to the higher light energy transmittance and optimization of the diffractive ring design. Total ocular aberrations were significantly reduced after surgery. There was also statistically significant improvement of the ocular Strehl ratio (from 0.11 ± 0.03 preoperatively to 0.14 ± 0.04 at 6 months postoperatively, p=0.019). The toric trifocal IOL is designed to make spectacle-free vision available to a broader group of patients. First clinical experiences with ZEISS AT LISA tri toric have confirmed an outstanding performance of this IOL. In an ongoing study of a series of patients, excellent visual acuity results for all measured distances were reported one month after surgery. Subjective reading acuity, measured with the Salzburg Reading Desk was 0.11 logMAR at a preferred distance of 38.9 cm. Subjective intermediate acuity was 0.03 at a preferred distance of 78.2 cm. In all cases of the study the lenses were stable and within 5 degrees of the intended axis one month after surgery. No IOL rotations were noted . Femto Cataract: Do We Really Need This?